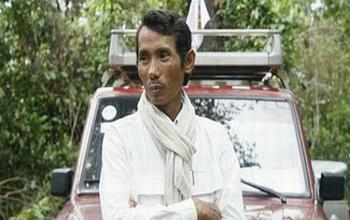 PHNOM PENH, Cambodia, April 26, 2012 (ENS) – Chut Wutty, a prominent Cambodian forest defender, was fatally shot today in an incident in Koh Kong province in which a military police officer also died. The deaths have been confirmed by military police spokesman Kheng Tito, although details of the incident remain unclear. Wutty, 41, founder and director of the Natural Resource Protection Group, dedicated his life to halting illegal logging and destruction of Cambodia’s environment. 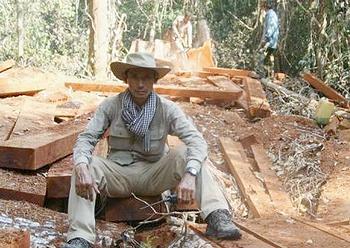 At the time of the incident, Wutty was driving two journalists from “The Cambodia Daily” newspaper through an area near the Central Cardamom Protect Forest. The two reporters, Cambodian journalist Phorn Bopha and Ukrainian Olesia Plokhii, were detained by police but they have been released. The Cambodian Center for Human Rights says Wutty, a former soldier, often has been subject to threats as a result of his work in this area of southwestern Cambodia. “In 2001 as part of a small Conservation International team sent to patrol for illegal logging in the Cardamom mountains, he was threatened by a military commander who said he would kill him over his investigations into illegal logging. He had to flee his hotel and rent a boat in the middle of the night that took him to safety,” the human rights group said today. In the face of continued threats and harassment, Wutty campaigned continually against the destruction of Cambodia’s natural resources. In 2011, he was threatened with arrest and criminal charges as a result of his work raising awareness of the destruction of Prey Lang forest in Cambodia’s northeast, said CCHR. In August and September, two training events he conducted with the Cambodian Center for Human Rights in Kampong Thom province for some 70 community members affected by the destruction of Prey Lang forest were disrupted by police and military police armed with AK-47s. “We need to dig deep, deep down for the root cause of the problem and the question that we should ask: Who is selling Cambodia to companies? Economic concessions authorized by the prime minister go beyond arable land to pristine forests of Cambodia,” wrote Sochua. Wutty was known for helping expose a state sell-off of land in national parks and for speaking out against corruption in business and government. “Chut Wutty was one of the few remaining Cambodian activists willing to speak out against the rapid escalation of illegal logging and land grabbing which is impoverishing ordinary Cambodians and destroying the country’s rich natural heritage,” said Patrick Alley, director of Global Witness, a nonprofit based in London and Washington, DC that campaigns against environmental and human rights abuses. Wutty is survived by his wife, two daughters and a son.